The Sioni Valley – cold and hidden from direct sunlight for most of the winter - is one of those areas where the snow remains longer than in the whole region and its quality is better than anywhere else at a similar altitude. Until the publication of this guidebook (summer of 2017), the route was rarely visited by freeriders (compared to other routes within Gudauri) due to lack of knowledge about the route, longer access to the beginning of the ascent (35 minutes by car), and the approach to the route (distance – 4 km, ascent – 400 meters, time – 1.5 hrs). But even with a significant increase in the popularity of this route, you can always find beautiful descent lines on untouched snow in a distinctly varied terrain, from snowy fields and giant couloirs with steepness of no more than 27º to steep walls and long couloirs between big rocks. Sioni is one of the most spectacular itineraries in the region, characterized by a long approach, excellent snow quality, and a large selection of descent lines in a varied terrain. The route starts from the village and consists of two relative parts – the approach to the beginning of the ascent with a smooth climb and the actual ascent from the Sioni Valley to the Tsiteli ridge or Kabarjina Mountain. The terrain is diverse. Here all forms of mountain relief are represented, except glaciers. Throughout the route there are views of Mount Kazbek and Mount Kabardzhina. The northern exposure of the Sioni Valley and of the slopes along the route is not lit by the sun during the major part of winter. Traversing the route early in the morning can be colder than expected - bring warm gloves and hot tea with you in this case. Statistics in this region are positive. There have been no accidents related to avalanches or injuries on the terrain. But, taking into account its remoteness from the Gudauri resort, lack of mobile connection on almost the entire route, as well as the high avalanche danger due to the relief, the absence of accidents is likely to be connected to the fact that the route is not well-known. Heading off to Sioni, you need to have a clear understanding of the nature of snow layers and the degree of stability of snow cover on slopes with a northern exposure before setting off for the route. If you go on a route without a professional guide, make sure that your companions are ready to ride on potentially dangerous mountain terrain. On the eve of taking the Sioni route, review your avalanche equipment working skills and knowledge of rescue operations. This advice is actually useful before going on any freeride route. Clarify the level of avalanche danger before setting off for the route! Daily updated information on the level of avalanche danger can be found in the Gudauri Travel Bar (www.gudauri.bar). Standard equipment for freeriding - avalanche transceiver (beeper), probe, shovel., Ski touring / splitboard set. The route starts from the village of Sioni, and is 27 km to the north of the Gudauri Resort on the Georgian Military Road. After passing the signal tower in Sioni village and the Soviet monument, in 300 meters there will be a signpost for the village of Garbani and a turn to the right. You will then need to drive 1.5 km through the village to the houses located at its highest point. Here the road ends and the skitouring ascent begins. Return to the resort by taxi. The cost of a 7-seat car to pick you up after the descent is about 150 lari. Note: After the descent and before returning to Gudauri, as you are already behind the Cross Pass and just a few minutes’ drive from the village of Stepantsminda (Kazbegi), why don’t you enjoy some Georgian dumplings, khinkali, in one of Stepantsminda’s restaurants, or savor a homemade lemonade in the restaurant of the Rooms Hotel Kazbegi with a great view of Kazbek. At the border of the village, you’ll find a very smooth climb for an hour and a half. The climb travels along the stream, deep into the gorge. Further on, the route depends on your chosen slope –you can either climb the Tsiteli ridge (to the left) or Kabardzhina Mountain (to the right). The ascent to the ridge is quite simple (indicated on the map by an orange line), and it is necessary to work with the terrain when climbing to avoid flutings, areas of snow accumulation on relief folds, and other avalanche sites. 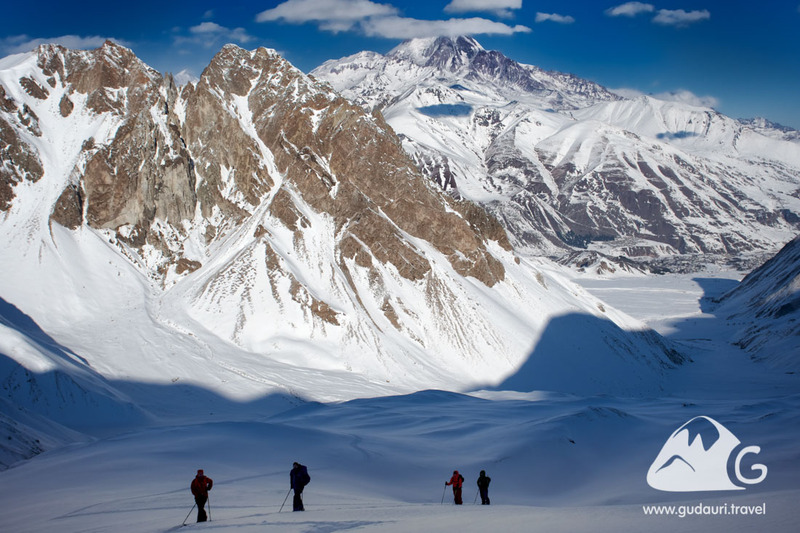 The ascent to Kabardzhina Mountain is available only for advanced athletes with vast experience in ski mountaineering and with necessary additional equipment (harness, rope, crampons, ice axe). The ascent to the Tsiteli ridge will take you to the crest in 1.5-2 hours; the peak that rises in front of you is bypassed to the right by a further exit to the ridge. Here you can warm up in the sun and eat before you go down, if you decide to descend along the ascent path. Also, if you are confident in stable snow cover on slopes over 30 degrees and in the absence of wind slabs, you can traverse to the west to the beginning of the descent into a giant couloir. After the descent, the return to the road travels along the ascent path, which is the last long flat section, and along the gorge, which is accessible by car. Telescopic poles will help splitboarders in this area.